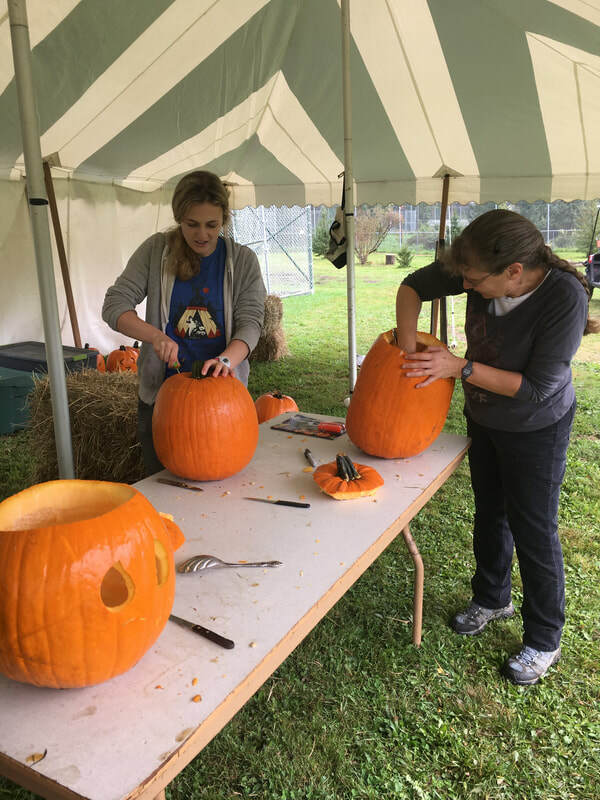 Volunteer or Intern with Wolf Mountain! Volunteers are defined as those who help at the Center on a regular basis, over a long period of time, such as months or even years. All volunteers are expected to work at least 12 hours a month; however, volunteering more time is greatly appreciated. See below for typical volunteer duties. Volunteers must be at least 16 years old and have reliable transportation. Interns should be currently enrolled in a related college program such as biology, pre-veterinarian, wildlife management, environmental conservation, etc. A minimum commitment of 15 hours per week for eight consecutive weeks is expected for interns. In addition to the volunteer duties listed below, interns are expected to also lead tours and ecology based woodland hikes, create and/or present educational materials for bulletin boards and presentations, develop animal enrichment programs, and observe/record animal behaviors (a more complete list of responsibilities will be provided upon application). Currently we have very limited, very rustic and primitive on-site housing for interns, thus we encourage you to make other arrangements for accommodations. Interested persons who wish to be considered to become a part of either our Volunteer and Intern Program must complete and submit an application. Please note: incomplete applications will not be honored. Volunteers and Interns accepted into our program will be required to complete a mandatory training program provided by center staff. 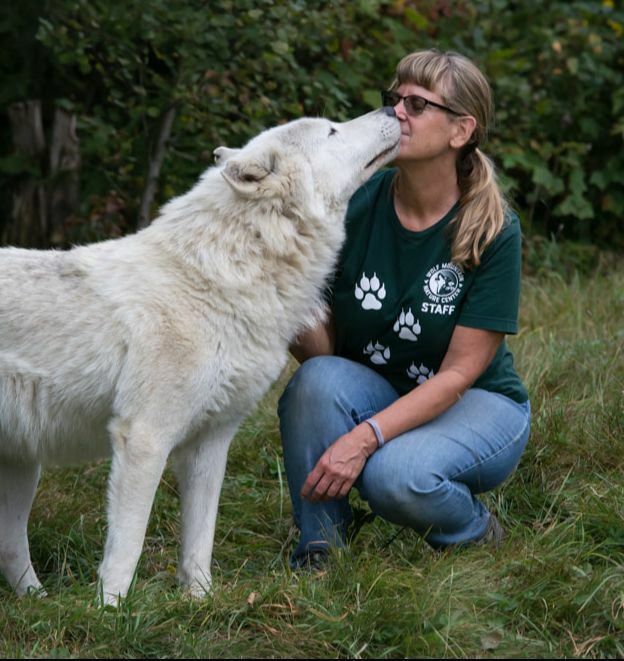 Please note: While we can certainly appreciate the desire many folks have to be able to touch and have physical contact with a wolf, animal interaction is a responsibility given only with time and experience. Staff who interact with the animals have many hours (literally hundreds!) of experience and training and have proven their dedication & dependability at our center prior to entering any wolf enclosures. Gaining a thorough knowledge of the animals is important before interacting with them. Our wolves are socialized, but we must follow very strict guidelines for both human safety and that of the animals. We are not a petting zoo; when staff enter enclosures it is for a direct purpose and not for entertainment or personal satisfaction. 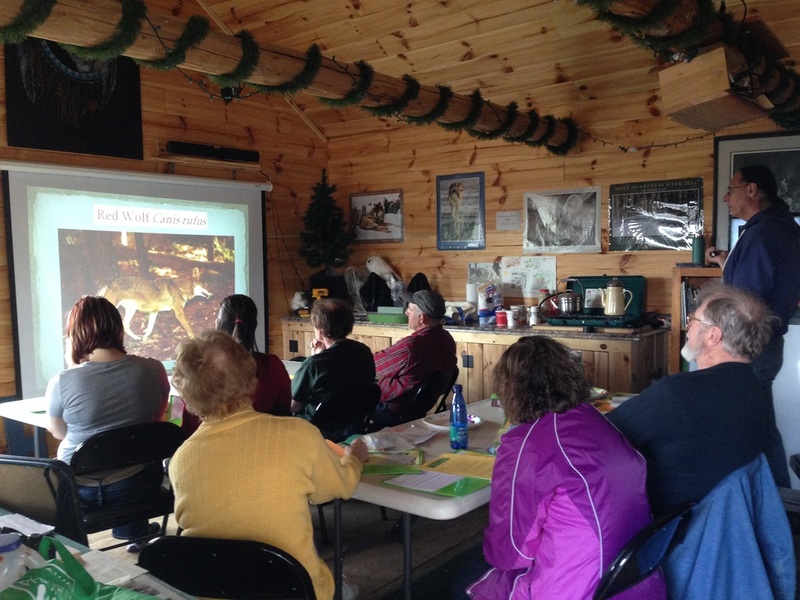 New volunteers will need to complete training, listen to the lectures, and learn as much about the animals as possible. Only those with experience gained at our center, approved by our Head Animal Curator, and listed on our DEC license can enter wolf enclosures. 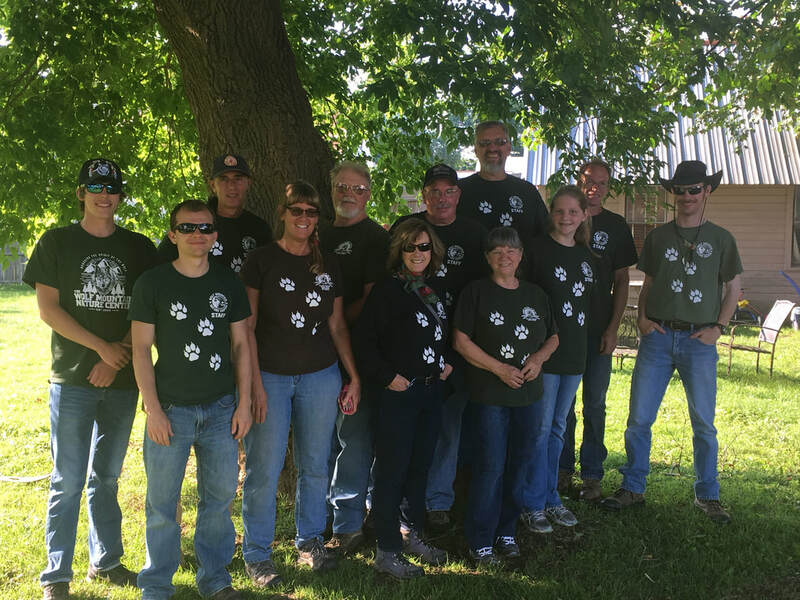 Meet some of our core volunteers at The Wolf Mountain Nature Center! ​ ...began helping out at the center in April 2012 as a fill-in cashier in our gift shop. Only days later, our 4 coyote pups were born and Pam immediately took on the role of assisting with bottle-feedings, cleanup, puppy sitting, and socializing the coyotes! She is one of our Animal Caretakers and has since been a "puppy parent" to a litter of coyotes, fox kits, and numerous wolf pups! Now living in a cozy log cabin located at the center, she oversees the entire gift shop, manages the volunteer program, coordinates scheduling of field trips to Wolf Mountain, organizes our summer camping programs, regularly feeds, cleans up after, and socializes with the animals, and assists with enclosure building, landscaping, providing educational tours to visitors, putting up tipis, and posts updates on our Facebook site! Pam plays the role of Red Riding Hood in the center's version of the well known children's story. In her spare time, Pam works as a Teaching Assistant for a local school district. She enjoys working with canines of all sorts, hiking, and being outdoors and experiencing nature! Karley interacting with one of our younger wolves. ​...first began working at the center as a college intern in the summer of 2016. A super quick learner, she mastered tours, information stations, the gift shop register, and many various animal enrichment programs! Now an Animal Caretaker, Karley played a huge role as a puppy parent, driving several hours to get here. She is one of our "weekend warriors" who arrives on Friday morning and works straight through until Sunday evening, often spending the nights in our staff cabin or in one of the center's tipis. Her exuberant personality and never ending energy is truly appreciated and contagious. She has a wonderful knack for getting things done efficiently and is fantastic with the animals. Karley also leads educational programs for visitors and has been crucial with co-coordinating our summer campout programs. Most recently, she has taken on the responsibility of Intern Coordinator. When not at the center, Karley works, spends time with her own dogs, and plans on returning to college in the near future. George LOVES working with the machinery! ...has been active with the center since 2013 and is the keystone of our maintenance and grounds workers. 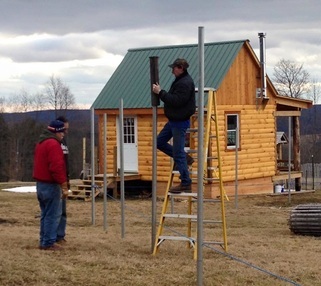 He is usually found performing the grueling task of pounding posts into the hard ground, clipping down dig guards, or putting up 10 ft high fencing. His favorite task involves anything that allows him to drive the tractor: driveway renovations, hauling gravel, or landscaping. He is also our head hot-dog griller. As an Animal Caretaker, George spends a fair amount of time with our foxes, coyotes, and the wolves. Usually seen with a big smile on his face, he says he enjoys being able to contribute to the completion of projects and gets a good feeling of accomplishment. George is also the "Woodcutter" in our Red Riding Hood play. During the week, George works for a local highway department, and enjoys volunteering and spending time with his daughter Annie who also helps at the center on occasion. 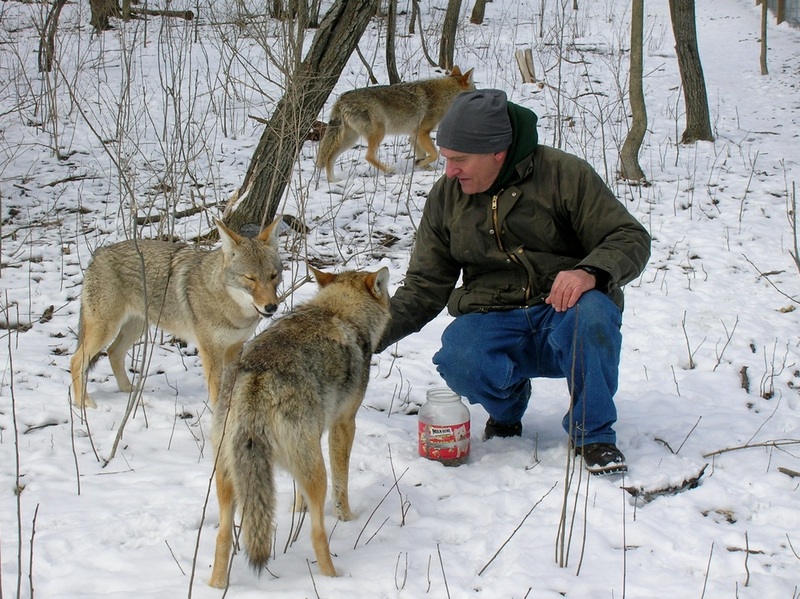 Dave with our Eastern Coyotes. ...has been volunteering at the center since 2011. He can often be found giving informational tours at the Arctic Fox enclosure and loves to spend time with our coyotes! 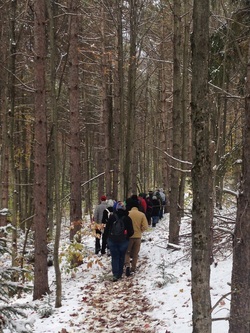 Another of our Animal Caretakers, he also helps out with class field trips at the center and can identify just about any tree on our wooded hiking trails! 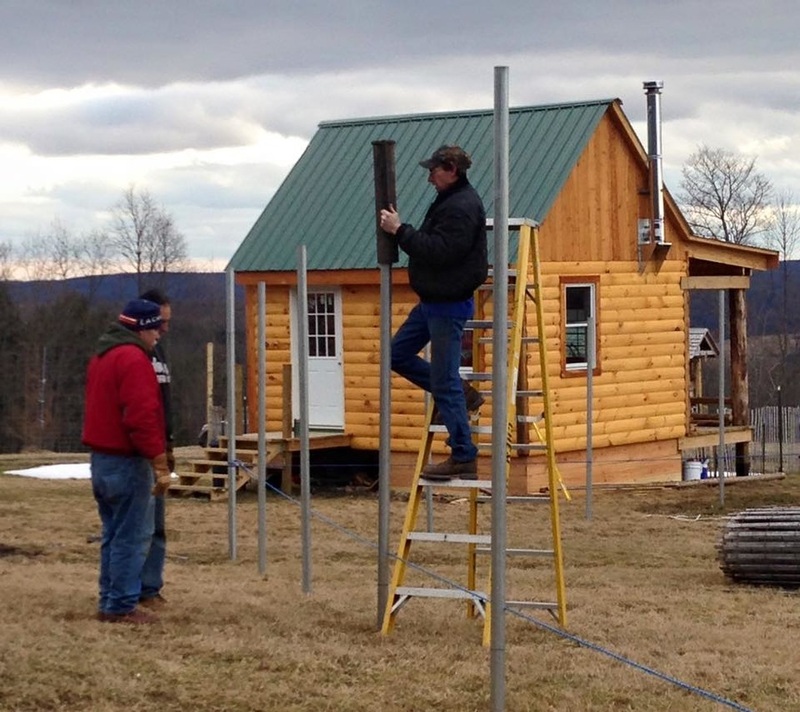 Dave assists with enclosure and building construction projects. His latest endeavor is creating carved walking sticks which he donates to the gift shop for sale to visitors. He often shows up at a moment's notice to help with special projects and is willing to do just about anything as long as it helps out the center! Dave is "retired" from his job, but still has jobs throughout the community. He also is an avid hiker and loves to share his stories and to spend time with his family at his lake house. Courtney and Dyani muzzle greeting. ... joined our volunteer staff in 2014 after participating in one of our photography platform programs. Her first task was running the register at our very busy gift shop for the annual fundraising event--not an easy job--but she handled it with ease! Since that time, she has become one of our Animal Caretakers and has helped with the shop on a regular basis and was one of our key "puppy parents" throughout the summers of 2015 and 2017. Every week we could count on Courtney to show up and dive right into the puppy care needs; she independently did everything from feeding, filling water buckets, scooping poop, raking out old and bringing in new hay, and playing with the puppies. We even caught her napping with them a time or two! When Courtney is not helping out the center, she works as a social worker, spends time with her busy family, hikes, and is an avid photographer. Sequoyah teaches Dean how to interact with an adult wolf! ...is one of our Animal Caretakers. He joined our team in December 2016 by serving hot cocoa to visitors at our winter festival. He was new to the area and looking for cool things to do and ended up at Wolf Mountain! A rather quiet guy, he has a very contagious smile and is willing to do any and everything asked of him. Dean was one of our puppy parents to Cypress and Tauriel and continues that bond today--he is now learning what the new "wolf rules" are as the pups have transitioned to adulthood! Dean runs educational programs at all of our exhibits and has assisted with the construction of several of the animal habitats. When he doesn't feel like working out at the gym, he comes to the center and fills/hauls gravel buckets for enclosures--a grueling task to be sure! 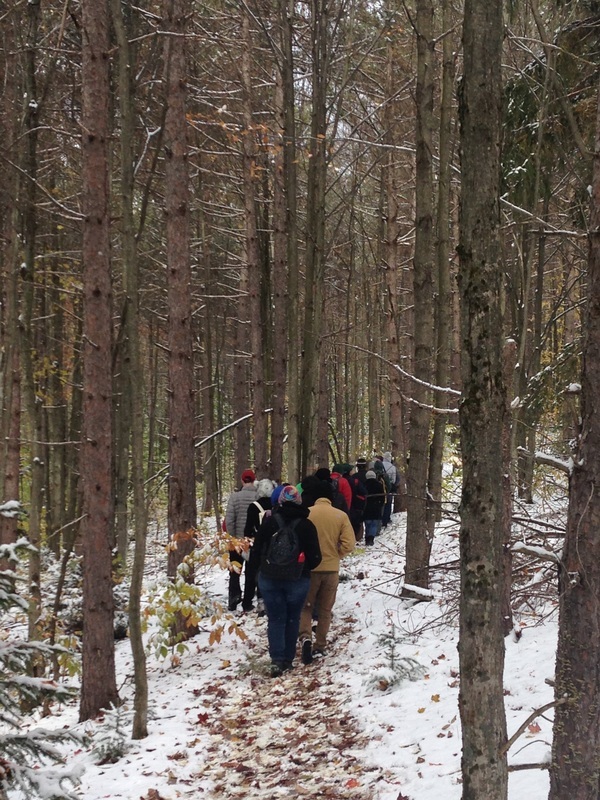 ​When he's not helping at the center, Dean teaches Special Education classes at the local BOCES, works out, loves painting, and spends lots of time hiking mountains! Shen putting up animal information signs prior to opening to the public. ...started volunteering with us in May of 2018 as a Junior in High School. With completion of courses in Honors Biology and Animal Science, experience working directly with animals at a veterinarian's office, and an active member of her local Environmental Club, Shen was a perfect match for the center! As an added bonus, she has hands-on experience with agricultural fence construction which definitely comes in handy when we are installing new fencing for our wolf enclosures! A hard worker, Shenequa has proven herself to be dedicated, responsible, and willing to learn. As a result, she recently has begun the training program to be an assistant caretaker with the Arctic Foxes. Shen is a huge asset to our volunteer team! Shen is currently a senior in high school with aspirations to continue her education at a college with a focus on biology and environmental science. ​...began volunteering in spring 2016. He is willing to help out with any project and has assisted with tasks such as painting and shoveling. Most often, he can be found performing labor or manning one of our information stations. Kamren assists his dad with presentations in our classroom on various types of snakes. He also assists with wolf feeding--the kid has an incredible arm when it comes to tossing chicken over a ten foot high fence!! Kamren has recently begun learning the fox program and has been known to don various costumes such as the Grinch at our winter event and a sweet, fuzzy wolf at our fall celebration. Currently an 11th grader on Honor Roll, Kamren's favorite subject is English. His hobbies include drawing, reading, and writing--in fact, he is currently writing his own book! His future plans are to become a game developer. Meghan with her ever present smile! ...visited the center for a year before deciding to apply as a volunteer in spring of 2017. She has participated in our summer camp outs and always has a smile on her face. Meghan is an Animal Caretaker which means she has earned the privilege and responsibility of going into animal enclosures to help with animal care and chores. She spent hours working with the pups as a puppy parent to Cypress and Tauriel. Currently she is learning the wolf program and recently completed a training course at Wolf Park in Indiana focusing on how to use myofacial and sacral release techniques on wolves.Meghan is always asking what she can do to help the center and then does it regardless of the task; she covers information stations, greets visitors, and assists with landscaping tasks. Meghan lives with her husband in Ithaca where the two share a Chiropractic office. In addition, Meghan teaches and shares her professional knowledge with others. She loves wolves and often describes Wolf Mountain as her place of relaxation and rejuvenation. ...is a relative new comer to the Wolf Mountain volunteer staff. In summer of 2017, Devin showed up with amazing credentials and started as a volunteer almost immediately! With experience in field ecology, environmental education, trail maintenance, and degrees in Biology and Wildlife Management (he even spent time in South Africa as a Research Assistant assessing the impact of elephant and rhinoceros ranges! ), Devin has become a valuable member of our staff! His first experience here was at one of our summer camp out programs where he shared some apples baked right in the campfire. ​Another of our long distance travelers, he volunteers two days in a row and spends the night in our tipis. Devin often provides information at our fox and coyote stations and will assist wherever else is needed; including those exhausting enclosure building projects. In October 2017, Devin headed deep into Canada for a conference on top predators and was accepted as a guest speaker! Skyler ready to welcome visitors! ...joined our volunteer kid team in spring 2016 with her brother Kamren. Skyler's main task is to welcome visitors with her cheerful personality, however, she helps shovel snow and is an awesome "chicken chucker" when it comes time to feed the wolves! She has also participated several times in our Camp with the Wolves program. Skyler is a 6th grader on High Honor Roll who loves science and hopes to become a scientist in the future. While she enjoys reading, drawing, being outdoors, hiking, and photography, her favorite past-time is figure skating; in fact, Skyler recently placed 3rd in the Empire State Winter Games in Lake Placid for her awesome skating skills!! ...and his daughter, Andrea, discovered Wolf Mountain Nature Center in the spring of 2016 and have been at the center every week since (even though its an hour and a half drive each way to get here!). After attending a "Camping with the Wolves" weekend and participating in "Wolves & Watermelons", he and Andrea decided to join our volunteer crew. Now, Howie assists with educating the public about wolves, coyotes, and Arctic Foxes and very recently, has begun the training program to become an animal caretaker. He also created a map of the sanctuary for visitors to use while roaming the center. Howie's favorite past-time is spending time with his daughter although hiking, fishing, drawing & painting, and computer animation are all high on his list as well! ...began working at the center in 2016 when she was only 12 years old! Although her dad also helps out, we are positive it was Andrea's persuasion that really hooked him! She would visit the center, then go home and memorize all the information we gave her or that she researched--her mind is a sponge when it comes to wildlife--wolves especially! Our volunteer minimum age requirement is 16, but since Andrea is so knowledgeable about wolves (and is rapidly learning about the foxes), and her dad is present to provide parental supervision, we decided to allow her to become part of our team. Although quiet, her infectious smile engages visitors in conversation quickly. As she matures and gains confidence, she has begun to be a crucial tour guide at the center. Andrea has participated in our "Camping with the Wolves", and has also helped with making wolf fur necklaces at our fundraiser events. Andrea is currently in 10th grade and loves English class. Her aspiration is to become a veterinarian. Hobbies include drawing, reading, and, of course, anything WOLVES!